Since I haven’t been waiting in line for standing room every night (though I promise I will be at Don Giovanni this Thursday), I’ve had some time to indulge one of my other hobbies: cooking! So here’s some operatic food. It’s not from the infamous Die Oper kocht, but rather Pasta alla Norma, supposedly renamed in honor of the opera of the same title (whose title role was first given by Giuditta Pasta, pictured). Like Bellini himself, it is popular in Sicily. And it tastes amazing. This recipe is based on the one from Marcella Hazan’s Essentials of Classic Italian Cooking, adjusted for laziness and greasiness. Serves 6, supposedly, but as a main course more like 3 (adjust amount of pasta accordingly). Yes, that’s a bag of frozen basil leaves. Sue me. The red pepper flakes were just hanging out there, I didn’t use them. *Ricotta salata is a kind of salty hard ricotta popular in Sicily and required by the most traditional versions of this recipe. You can find it in Italian grocery stores. 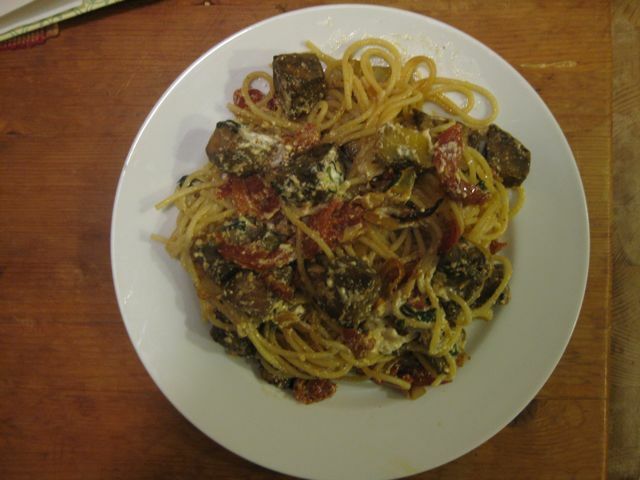 I did find some but it cost $8 (this is not only Lazy Cooking with Zerbinetta but also Cheap Cooking with Zerbinetta) so I used regular ricotta instead, which tasted fine. You could also try feta or even fresh mozzarella. 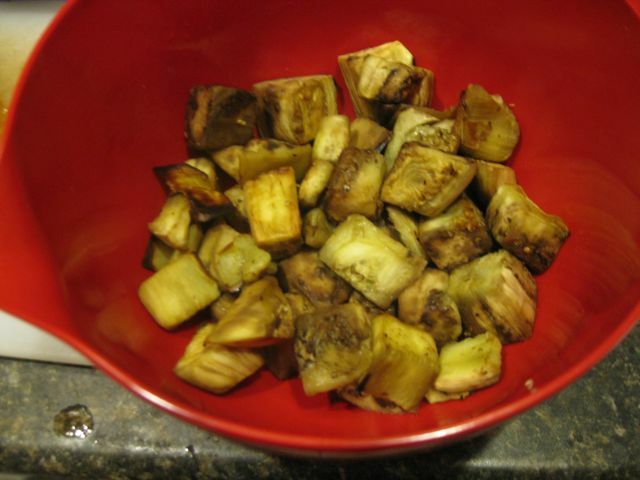 Peel the eggplant (or not) and chop it into small cubes. If desired, salt, let sit for a while, and dry off to make it less bitter. Start heating up some water to cook the pasta. I may have overcooked it a little bit but it tasted fine. 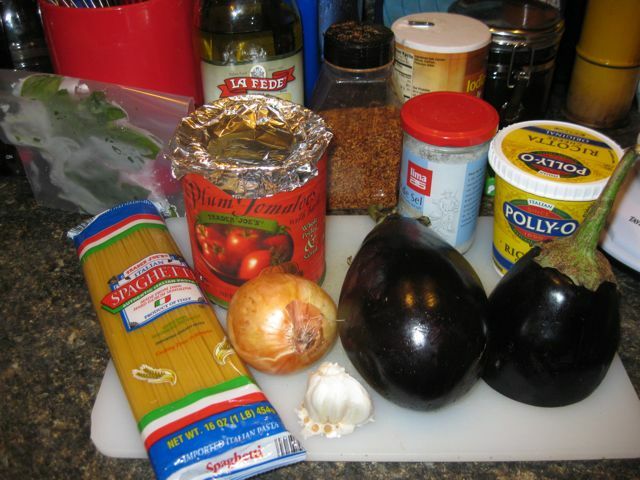 While the eggplant is cooking, slice the onion very thin, mince the garlic and cut the tomatoes into narrow strips. When the eggplant is done, set it aside. Heat 1/4 cup of olive oil in a frying pan over medium-high heat. 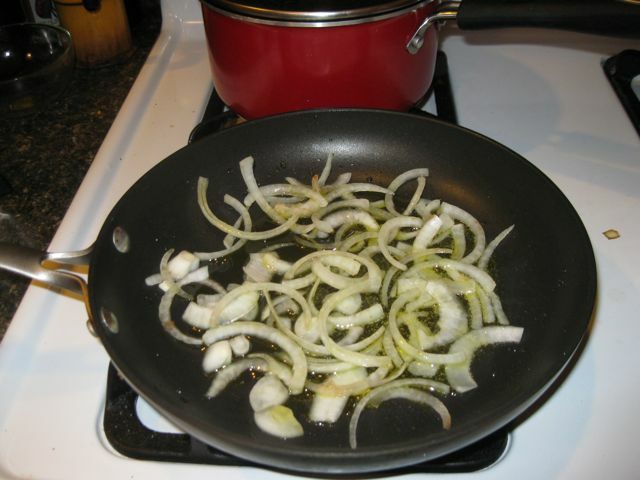 Add the onion and cook until golden, around five minutes. 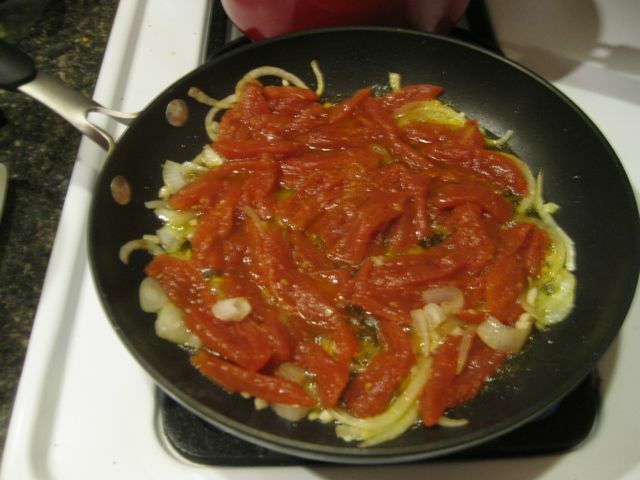 Add the garlic and stir, then quickly add the tomatoes and turn the heat up to high. Cook around ten minutes or until it looks done. When the tomatoes are getting towards done (drier and turned a darker color), add some salt to the boiling water and start cooking the pasta. 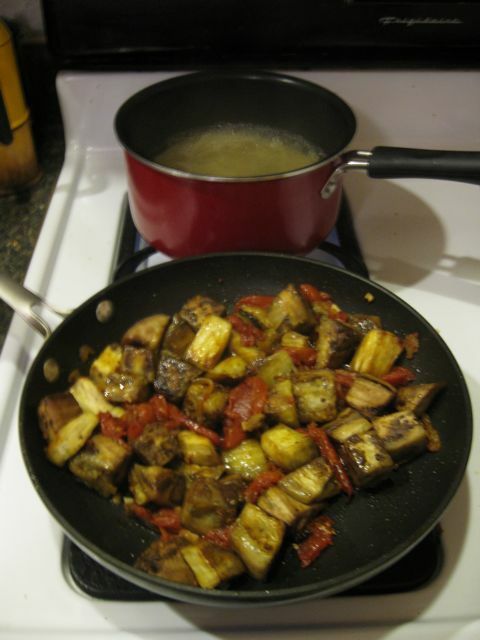 eggplant and stir. Turn the heat down or off if it looks like it might burn. and basil leaves. Add a little Parmesan if you feel that the dish is still lacking in cheese, and enjoy.